Osteoarthritis after a car accident, also known as post-traumatic osteoarthritis, is relatively common. If you are suffering from osteoarthritis linked to a car accident, you may be entitled to compensation for your accident-related expenses. Sometimes called degenerative joint disease or degenerative arthritis, osteoarthritis is a condition where the cartilage on the ends of bones wears down or erodes. Since cartilage provides a cushion that allows for pain-free movement, this creates difficulty when engaging in everyday activities. Over time, the loss of cartilage can cause bones to break down or develop growths called spurs. Osteoarthritis is most common in older people, overweight people, and those with a family history of the condition. However, trauma from a car accident or another serious physical injury can also lead to the condition. For example, statistics indicate that about 12 percent of osteoarthritis cases affecting the knees, hip, or ankle are caused by some type of trauma or accident. Osteoarthritis is characterized by tenderness, inflammation, and pain in the joints, as well as feelings of stiffness and an overall loss of flexibility. Patients are diagnosed by a description of their symptoms, as well as through tests such as blood tests, x-rays, and MRIs. Medication. Pain relieving medication, anti-inflationary injections, and nutritional supplements are commonly recommended for osteoarthritis sufferers. Hot or cold packs. Using a combination of hot and cold packs can help control pain. Exercise. A physical therapist can suggest strengthening and stretching exercises to improve range of motion. Assistive devices. Scooters, walkers, canes, braces, or shoe orthotics can help osteoarthritis sufferers maintain their independence. Massage. Although it is still considered an alternative treatment, massage is often shown to help osteoarthritis sufferers better manage their pain. Surgery. Depending upon what joints of the body are affected, surgery can be beneficial. At home, many osteoarthritis sufferers manage their condition by rearranging their surroundings to reduce the need for bending, stooping, lifting, and other painful activities. For example, someone with osteoarthritis in their knees might rearrange cabinets to place the heaviest objects at waist level. If your doctor believes that your osteoarthritis is linked to trauma from a car accident caused by another driver's negligence, you can file a personal injury claim seeking compensation for accident-related expenses. Personal injury claims can include compensation for medical care, lost wages, and pain and suffering. Medical care. You can seek reimbursement for the cost of diagnostic tests, pain relieving medication, assistive devices, therapy, and any surgical procedures used to treat your osteoarthritis. Lost wages. Compensation for lost wages includes time off work immediately following your accident, as well as loss of future earning potential if your osteoarthritis is severe enough that you are unable to return to work or working reduced hours. Pain and suffering. Osteoarthritis can result in chronic pain, leaving you unable to complete household chores, spend time with your family, or enjoy certain hobbies. Pain and suffering compensation reimburses you for the physical and emotional effects of the accident. To support your claim for damages, you will need to provide copies of your medical records as well as medical bills, bank statements, and pay stubs. Expert testimony from doctors with experience treating your condition or from a vocational counselor who can testify as to how your injuries have limited your earning potential may also be needed. 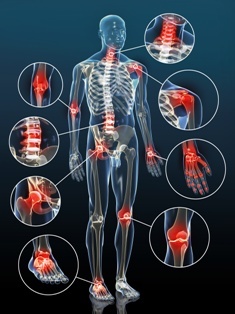 Osteoarthritis is a progressive disease and is often present at the time of a collision as a pre-existing condition. At times, an injury victim may have no pre-existing symptoms, but after the collision, the osteoarthritis along with the injuries combine to cause pain and symptoms, sometimes worse than if there was no osteoarthritis present at the time of the collision. The challenge is proving the change in the condition of the osteoarthritis between before and after the condition. Using the client’s medical records before the collision can show the existence of absence of pre-existing symptoms. You have up to two years to file a claim, but it is best to begin as soon as possible so evidence and witness testimony are easier to locate. Working with an experienced attorney is the best way to ensure that your rights are protected throughout the process since insurance companies are financially motivated to settle cases for the smallest amount possible. Without an advocate on your side, you may end up with a settlement that doesn't adequately meet your financial needs. Inland Empire Law Group's skilled personal injury attorneys are devoted to helping California residents seek the compensation they need to move forward with their lives following serious car accident injuries. Contact us today to schedule a free, no-obligation initial consultation. Appointments are available at our Victorville or Rancho Cucamonga locations or call 888.694.3529.